Bluewrist returns to the Automate show for the third consecutive time and debuts our brand new PreciScan3D Inspection Station. With out-of-the box 3D scanning and dimensional measurement capabilities, our fully integrated solution can be rapidly deployed for in-line, near-line or off-line quality control applications. 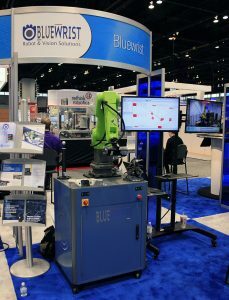 By eliminating the need for costly custom integration or specially designed safety cell, the Bluewrist PreciScan3D Inspection is ideal for manufacturers who are making their first foray into a flexible measurement system to help them take quality control to the next level.